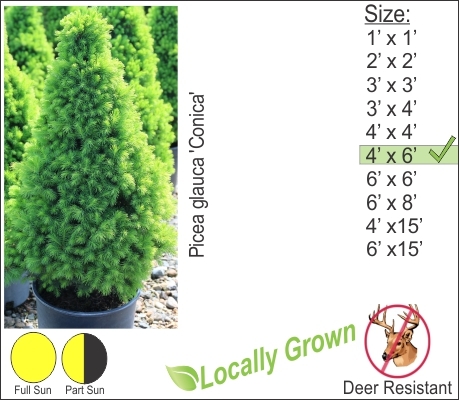 A tightly formed compact growing evergreen, Alberta Spruce is an old time favorite. This evergreen works well in limited space landscapes. It will grow slowly over time to a height of 6-8 ft with a 4ft. spread. Spray this spruce with horticultural oil in late April / early May to control spider mites. Alberta Spruce looks very nice when Gold Mounded Spirea are planted around it.